Heat oven to 350°. Melt margarine in large saucepan over medium heat. Add celery and onion; cook and stir 3 minutes or until crisp-tender. Stir in all remaining casserole ingredients. Pour into ungreased 1 1/2 or 2-quart casserole. Bake at 350° for 30 to 35 minutes or until thoroughly heated. Sprinkle topping ingredients evenly over casserole. Bake an additional 5 minutes or until topping is warm. Make-Ahead Directions: Prepare recipe as directed above except omit topping; do not bake. Cover with foil; freeze. When ready to use, do not thaw; bake, covered, at 350° for 1 hour 40 minutes. Uncover; sprinkle with topping. Bake an additional 5 minutes until topping is warm. Preheat oven to 350°F. Spray a 9×13 inch baking dish with cooking spray. Heat oil into a medium pot over medium heat. Saute onion and carrots until softened, stir in garlic and cook for another minute. Stir in cooked chicken, both rices, salt and pepper. Reduce heat to low. Pour the GF broth in a medium saucepan, add cornstarch, whisk continuously over medium high heat, add salt and pepper. Continue whisking until thick and near boiling, stir in cheese, whisk until melted, add yogurt, whisk again. Pour cheese sauce into rice mixture, mix it all together and transfer to prepared baking dish. Top with 1 Cup additional cheddar cheese. Casserole can be prepared to this point and then chilled or frozen for later use. If casserole is cold when it goes in the oven, increase baking time by 10-15 minutes. If frozen, allow to defrost in the refrigerator overnight before baking, or defrost in a microwave oven. Bake covered for 40 minutes or until cheese has melted through. Remove cover, sprinkle top with fresh chopped cilantro. Return to the oven for another 10-15 minutes, until top is golden. Serve hot. Preheat oven to 500°. Place a 12-inch cast iron skillet in oven (leave pan in oven as it preheats). Heat 1 tsp. oil in a large nonstick skillet over medium-high. Add onion; saute 2 minutes. Add carrot, celery, and peas; saute 1 minute. Remove vegetable mixture from nonstick skillet; set aside. Add flour and remaining 1 Tbsp. oil to nonstick skillet. Cook 30 seconds, stirring constantly. Slowly add stock, stirring constantly. Bring to a boil; reduce heat, and simmer 3 minutes or until thickened, stirring frequently. Remove from heat. Place dough on a lightly floured surface; roll into a 12-inch circle. Carefully place dough in preheated cast-iron skillet; flatten to cover bottom of pan. Bake at 500° for 5 minutes or until crust is lightly browned. Remove from oven. Top pizza crust with 1/2 cup stock mixture, vegeatable mixture, chicken, and cheese. Broil 2 minutes or until cheese is melted. Drizzle with remaining stock mixture. Sprinkle with thyme, pepper, and salt. Cut into 8 slices. Preheat 425°. In saucepan, combine chicken, carrots, peas, potatoes, and celery. Add water to cover and boil 15 minutes. Remove from heat, drain and set aside. In saucepan over medium heat cook onions in butter. Stir in flour, salt and pepper and celery seed. Slowly stir in chicken broth and milk. Simmer over medium-low heat til thick. Remove from heat and set aside. Place chicken mixture in bottom pie crust. Pour hot liquid mixture over. Cover with top crust, seal edges and cut away excess dough. Make several small slits in top of crust. Bake 30 – 35 minutes. Cool 10 minutes before serving. Brown ground beef. Add all other ingredients. Bake 1 1/2 hours at 375°. Mix sour cream, chilis and soup. Add 1/2 the sauce, 1 1/2 cups cheese and onions to chicken. Mix. 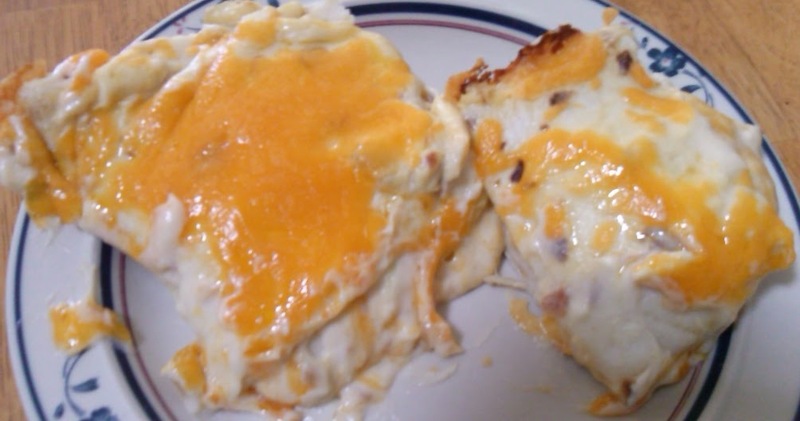 Spoon chicken mixture onto tortillas and place seem side down in greased lasagna-sized pan. Cover with remaining sauce and cheese. Bake 350° for 20 to 30 minutes. Serve with salsa and remaining sour cream left from a 2 cup container. Preheat oven to 350°. Cook mostaccioli according to pkg. directions; drain. Meanwhile, in large sauce pan, melt margarine; stir in flour, salt and pepper. Gradually stir in milk. Cook and stir until mixture thickens (mixture should coat spoon). Remove from heat. Add 1 cup cheddar cheese; stir until melted. Stir in cooked mostaccioli. Spoon half of mostaccioli mixture into greased 2-quart baking dish; top w/swiss cheese then remaining mostaccioli mixture. Sprinkle w/remaining cheddar cheese. Bake 20-25 minutes or until bubbly. In large skillet, brown ground beef. Add mushrooms, onion and garlic, cook until tender. Stir in flour and then gradually stir in beef broth, stirring constantly until mixture thickens. Stir in ketchup and seasonings, simmer on low heat 15 minutes. Cook noodles according to package directions, drain. Slowly blend sour cream into meat mixture, heating thoroughly (do not boil). Serve stroganoff over hot noodles. Serves 4. In large skillet, cook ground beef. Stir in salsa, reduce heat, and simmer 20 minutes or until liquid is absorbed. Stir in taco seasoning mix and black beans. Heat through. Cook the pasta as directed. Cook beef and onion til brown; drain. Add pasta, tomato sauce, oregano, cinnamon, salt, pepper. Heat to boiling, reduce heat. Simmer 5 minutes uncovered. Remove from heat, sprinkle cheese. Cover, let stand to melt cheese. Sprinkle parsley. Bring large pot of lightly salted water to a boil. Add lasagna noodles and cook 8 – 10 minutes or until al dente; drain. Sauce: In skillet, brown ground beef until cooked thru; drain grease. To browned ground beef add oregano, basil, garlic powder, sugar, salt, pepper and tomato sauce. Heat thru, stirring occasionally. In 9 x 13 pan, alternate layers of cooked lasagna noodles, sauce, and filling, making 3 layers total. If desired, top w/more mozzarella cheese. Bake 40 minutes. Let stand 10 minutes before cutting. Cook creamettes. Spread in 9 x 13 pan. Mix egg, milk, salt, and pepper. Pour over creamettes. Brown hamburger, onion and green pepper. Add tomato soup. Season to taste w/salt, pepper, oregano and garlic salt. Cook 15 minutes, stirring constantly, until it thickens. Pour over creamettes and top w/mozzarella cheese. Bake for 30 minutes at 350°. In a small bowl, combine tomato paste, water, parmesan cheese, garlic, honey, onion powder, oregano, marjoram, basil, ground black pepper, cayenne pepper, red pepper flakes and salt. Mix together, breaking up any clumps of cheese. Sauce should sit for 30 minutes to blend flavors; spread over dough and prepare pizza as desired. Combine 1 cup flour, yeast, sugar, and salt in bowl. Add water and oil. Mix well. Gradually add 1/2 cup flour until soft dough ball is formed; will be slightly sticky. Add additional flour to form dough ball. Knead on a floured surface adding additional flour if needed, until smooth and elastic; about 4 minutes. With floured hands, press dough out to fill greased pizza pan. I grease pan by rubbing oil on it, then sprinkle some corn meal on it. Top as desired with pizza sauce, toppings and cheese. Bake for 12 to 15 minutes until cheese is bubble and crust is brown. Taken from Fleischmann’s Pizza Crust Yeast pkg. Put soup in baking dish. Add milk, veggies, hamburger, salt, and pepper. Top with frozen tator tots. Bake uncovered for 1 hour at 350°. Preheat oven 425°. Heat oil in large sauce pan over medium. Add onion, garlic and season w/salt and pepper; cook stirring occasionally, until softened, about 5 minutes. Add thyme or oregano and tomatoes. Bring to a boil, reduce heat and simmer, breaking up tomatoes w/spoon until sauce is thickened and reduce to about 5 1/2 cups. 20-25 minutes. Meanwhile, cook ravioli in a large pot of boiling, salted water just til they float to top. (Pasta will continue to cook in oven.) Drain and return to pot. Toss pasta w/sauce. 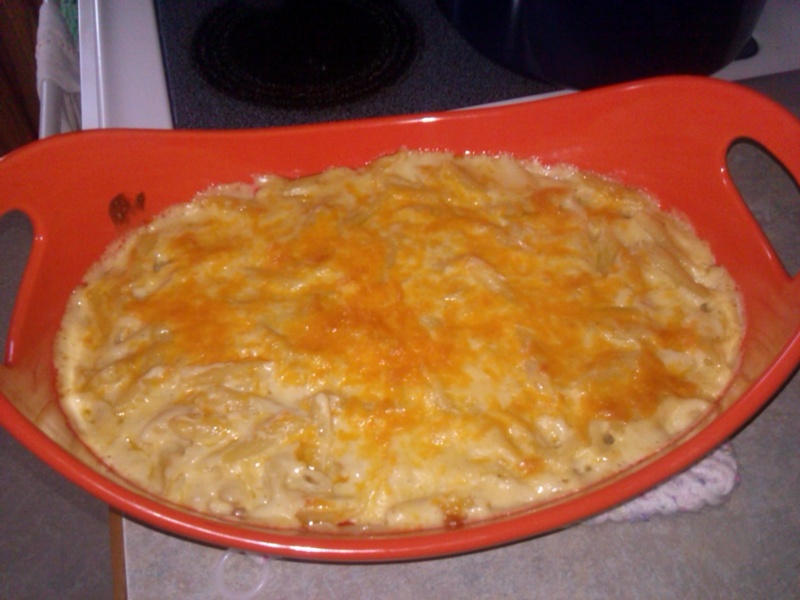 Pour pasta into 9 x 13 baking dish – sprinkle w/cheeses. Bake until golden 20-25 minutes. Cool slightly before serving. Grease baking dish. Brown hamburger. Cook noodles. Combine all ingredients in baking dish. Bake 350° for 1 hour. Cover the first half hour, then uncover. Brown hot dogs in butter. Dump cooked and drained noodles into hot dogs. Add cream of celery soup and milk. Cook til heated thru. Cook stuffing following box. Cook veggies 6 minutes or until tender. Mix together cream of chicken soup and sour cream. Pour over veggies. Layer starting with stuffing mix then veggie mix. Top with grated colby cheese. Bake 350° until done, approximately 1/2 hour. Wow, all those recipes sound good.